A home’s siding tends to take a beating over time. After all, it’s one of the only elements that protects the exterior and interior of your home from a variety of factors, such as animals and inclement weather. That being said, it’s important to keep siding up to date and in good condition. Having a qualified siding contractor in Allen Park Michigan can help you preserve your home and stop water damage to your home before it starts. As soon as you detect that your siding is failing, you should replace it. But, how can you identify when it’s time to replace your siding in Allen Park Michigan? Continue reading to learn about five common signs it’s time to replace your siding! Water damage is one of the largest indications it’s time to replace your siding. Water damage can be extremely detrimental to your overall home, especially if it goes undetected for a long time. That’s why it’s important to take care of it and replace your siding as soon as you discover water damage. Typically, you will be able to detect water damage from the interior of your home. Simply look for warped spots, bubbles, and water collection on your walls. Water damage causes these things because the moisture seeps into the siding and causes cosmetic damages to the paint and loosen walls. Another serious issue that is an indicator it’s time to replace your siding is mold. Like water damage, mold can cause a ton of other problems in addition to ruining your siding. That’s why you should eliminate mold as soon as you discover it. If you discover mold growing and don’t take care of it as soon as possible you’re not only putting the strength of your home at risk, but you also put your health at risk because mold is known to cause serious health conditions. As your siding ages, its sound efficiency decreases. This means that your siding won’t be able to separate indoor and outdoor noise as well as it used to. Instead, it will seem like there’s no sound barrier between the inside and outside of your home. Another easy way to detect your siding’s sound efficiency isn’t as great as it once was is during high winds. Typically, modern siding is able to keep the sound of high winds out of a home. In fact, most homeowners are most likely unaware of high winds when they occur because their siding traps the sound so well. But, if your siding is failing, you will be able to hear the sound of high winds as if you were sitting outside. One of the easiest ways to tell whether or not you need to replace your siding is by cosmetic damages. Simply inspect your siding for common cosmetic damages, such as dry rot from fungi growth, scratches, and dents. While minor scratches and dents might not be indicators you need to replace your siding yet, finding an influx of all these damages is a huge sign it’s time to replace your siding. It’s never a good sign when insects start crowding in an area of your home. Often, finding insects is an indicator of a larger problem, such as mold growth or water build up. If insects have penetrated your siding, you will most likely be able to identify the issue from small external holes where they entered the siding. If you detect any of these signs, it’s obviously time you replace your siding on your Allen Park Michigan home. Although some of these signs might be overwhelming and worrisome, don’t panic. All you have to do is contact your local contractor to take a look at the current condition of your home. Your local contractor will be able to create a plan on how to fix any damage, as well as your siding. One of the best siding contractors in Allen Park Michigan is All Point Construction. 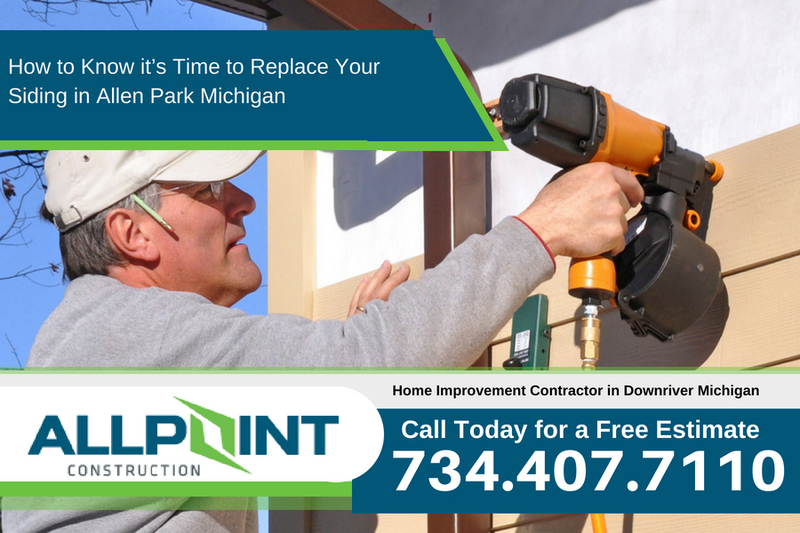 You can get a free estimate on your siding project in Allen Park Michigan by calling All Point Construction at 734-407-7110. Signs That It’s Time to Replace Your Home’s Siding in Downriver Michigan?